All the goodness of a sloppy joe without the carbs or wheat! Hallelujah! I love sloppy joes. Who doesn’t? Seriously, do you know anyone who doesn’t like sloppy joes? Alas, once I started cutting out wheat, no more sloppy joes for me – until the day I cooked up a batch for a backyard barbecue and couldn’t resist making a few tweaks so I could have some too. I can’t believe that I hadn’t thought of this before. I don’t add sweetener when I’m making this for myself but many people like the extra sweetness so I’ve included that option. In a large skillet over medium-high heat, sauté ground beef or turkey for 5 minutes. Add onion and green bell pepper; sauté for 5 more minutes or until vegetables are just barely tender. Drain off any fat. Stir in remaining ingredients except shirataki noodles. Cover and leave on stove until mixture has thickened, approximately ten minutes. It will thicken a little more when it cools down some. While sauce is cooking, prepare shirataki noodles according to package directions. If someone in your family prefers to have theirs on a bun, that’s fine, as long as you have yours over the shirataki pasta. Set aside half of the sauce to use for another meal. Serving size is based on using ¼ of the portion of sauce left for this meal. 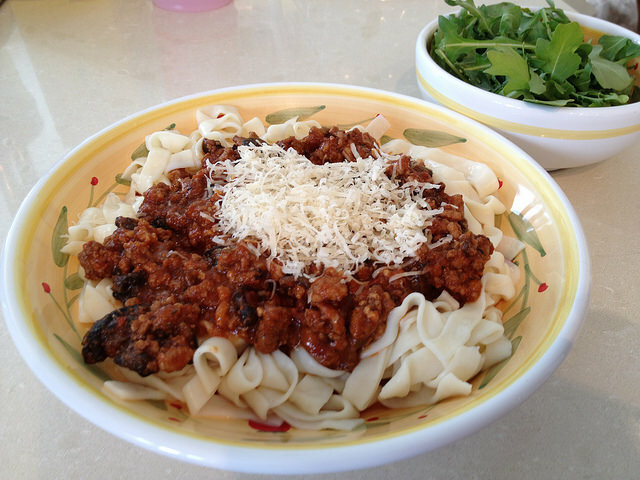 Serve the sauce over regular pasta or buns for anyone who doesn’t appreciate shirataki pasta.